Previously, on MinerBumping... For weeks, Agent Kalorned received nothing but contempt and disrespect from highsec miner Vipsla. Then the day came when Kalorned took Vipsla's Orca away. Vipsla's attitude changed in an instant. He purchased two mining permits and gave Kalorned 630 million isk worth of assets. But Vipsla still owed Kalorned a fee for copying Agent Bing Bangboom's corp logo. From his newly Orca-less alt, Vipsla waved the white flag of surrender. He'd rather quit EVE forever than pay more money to get his Orca back. Vipsla claimed that he was completely broke. Kalorned was skeptical. And he was right to be, considering the miner's behavior over the past few weeks. Suddenly, more assets materialized out of nowhere. The miner prodded Kalorned to accept them quickly. Our Agent valued the assets at roughly 150 million isk. It wasn't what he'd asked for, but it was a start. Kalorned accepted the contract. The miner once again declared himself to be fresh out of money and assets. That had been the last of it. In speaking with the Russian miner, Kalorned was reminded of the old saying: Trust, but verify. Vipsla was unwilling to give away an API key, though. He again threatened to quit EVE forever. Kalorned could've left it at that, but he remembered all of the ways the miner had corrupted Gamis local chat. Our Agent understood the miner. He had to press onward. Miraculously, someone who'd spent his entire EVE career solo mining got money from a "friend" at just the right moment. 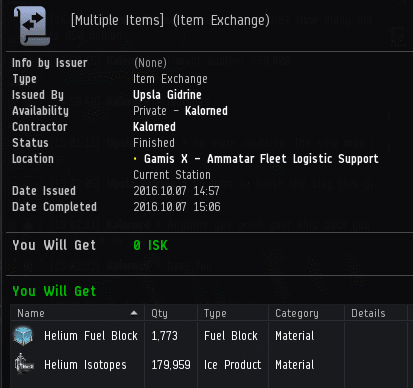 An additional 150 million isk was deposited into Kalorned's wallet. Kalorned confirmed receipt of the funds. In a generous mood, Kalorned offered to finalize the transaction if he received another payment. Vipsla was a rude, arrogant miner and blinded by greed. But he was no Klase Shola. There would be no more payments. In all, Vipsla paid Kalorned roughly 950 million isk. He refused to pay anything else. Oh, and Kalorned got to keep the Orca, so you can add that to the tally. Vipsla left the conversation and the system in anger. After all his weeks of anti-Code rhetoric and inappropriate conduct, he finally surrendered. Vipsla never returned to Gamis again. Due to the miner's disrespect and deceit, his mining permits can be considered revoked at this point. Kalorned remains optimistic about the prospects of bringing Vipsla into the fold, one day. He was so close to getting that ship back, if only he had faith in the system. and believing that makes you a special kind of stupid. And he was the 100th client too. A shame he had to leave with his tail between his legs. Looks like Zopiclone is getting more ganks than you are. Ohhhhh yeah I just went there. Upsla is such a Klase Shola. But where oh where is veers? But where oh where is dryson bennington? But where oh where is foxbolt? But where oh where is kip wanker? But where oh where is pejedus? But where oh where is zopifag? But where oh where is butthurt miner? But where oh where is jtclone? But where oh where is fagfoot? But where oh where is chloe ocean murray? But where oh where is capt lynch? But where oh where is kalynn sardini? But where oh where is Ledrian? But where on where is u.s.a.t.o.? But where oh where are the en marlands? But where oh where is ag? But where oh where is 331's balls? But where oh where is your mom?